This book had my attention from page 1. Honestly, I couldn't stop reading it. From the beginning where we meet Joe Matthew and is his sweet son, Bobby- I knew this story was going to be good. The story starts off with a father and his son trying to leave a past behind for a different future. Only to find that in the middle of this their truck breaks down and they find themselves in Sugar Creek, Ohio surrounded by Amish folks who talk a bit different and have different customs, luckily for Joe and Bobby, a kind man helped them find a place to stay, which then turns into a place where Joe lives with three Aunts for a while and helps take care of their hope. He also meets Rachel, a cop who wants to know Joes story and won't let it rest until she figures out what he's all about and why he's running from his past. The three Aunts are funny and great women. The character development in this story makes the aunts likeable and very relate-able. Rachel however, is the hardest character to relate to, until Joe finds her back story about her why she is so closed and suspicious of trusting others. 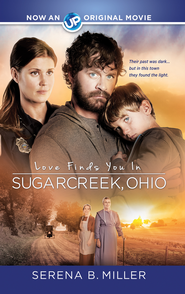 Will Rachel uncover the mystery of why Joe is really in Sugarcreek? I truly enjoyed my visit to Sugar Creek and learned a lot about the Amish community, customs and culture. If you're looking for a book with an interesting plot, full of character development and dynamic twists and turns, this book will keep you turning the pages! Thank you to Guideposts and SummerSide Press for allowing me to review this book. I was not compensated for a positive review, but received this book for review purposes only. Happy Mothers Day to thee Best!